'Indians would not put him on a par with Kapil Dev or Vinoo Mankad,' points out Uddalok Bhattacharya. 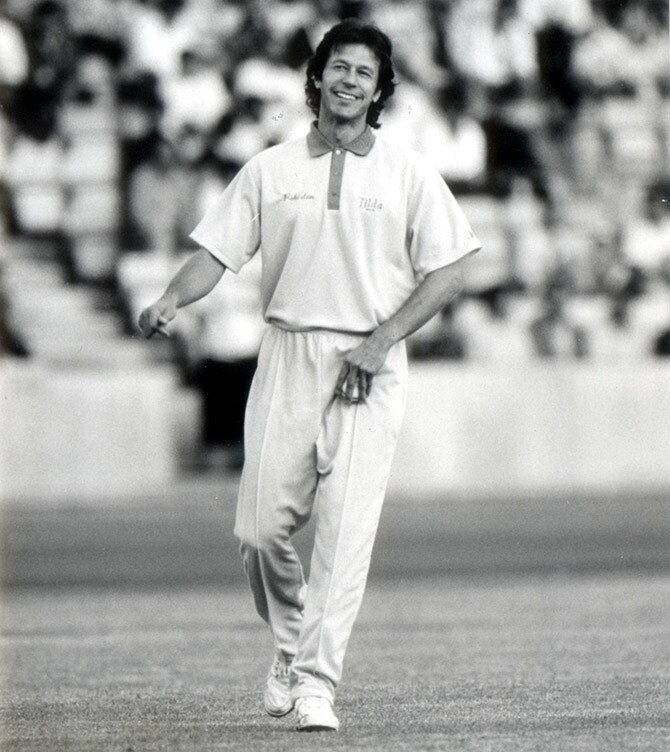 IMAGE: Imran Khan at an exhibition game at the Crystal Palace stadium, July 28, 1992. Many fast bowlers have kept excellent form at 30. Malcolm Marshall did it, and so did Dennis Lillee, though the Australian had lost some of his earlier speed owing to repeated back problems but made up for that by scaling up his swing. But never has a fast bowler, at least not since Harold Larwood, reached his peak at 30, in pace as well as swing, in the way Imran Khan did in the 1982-1983 series against India in Pakistan. Such was his venom that Lala Amarnath had remarked that he had never seen such a 'combination of pace and swing'. 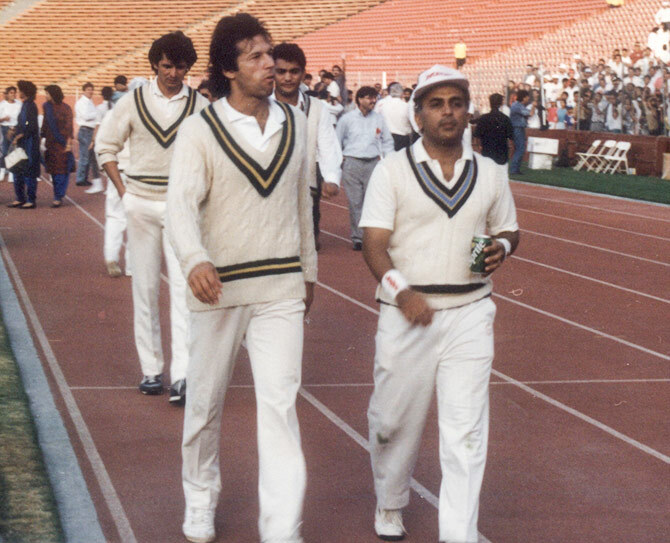 Those who saw Imran bowling in that December (1982) afternoon in Karachi would, in some measure, agree with Amarnath. An ecstatic Pakistani commentator said on TV he could compare that spell only to the one that Lillee bowled against 'us' in Australia in 1976-1977. Each time Imran sliced through Indian batting in that series (he did it at least thrice), it was in his second spell, when the ball was more than 30 overs old. It's still an enigma as to how he could generate that level of swing with an old ball. This led to speculation about whether he was utilising the time that the 30 overs provided to fiddle with the ball, stripping away the skin on one side to make the other side heavier, which would inevitably facilitate swing. No one, however, saw him (or anyone else in the team), on TV or on the ground, doing it. So this was entirely speculation, which died down when Imran said 'I'll retire from the game if anyone can prove I have tampered with the ball'. But many years after this, Imran did admit to having tampered with the ball while playing in English county cricket. No mention was made about the India series. So, what happened in 1982-1983 is still a puzzle and the memory of it, fortunately for Imran, is lost in the mists of time. 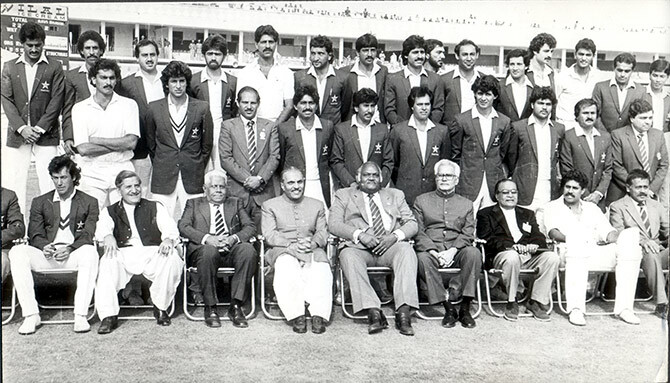 IMAGE: Imran Khan, left, with then Pakistan's military dictator General Zia-ul Haq, fourth from left, Indian and Pakistan cricketers, and cricket board officials from both nations at the Jaipur Test in 1987. If a cricketer has struck his best form at 30, there is no guarantee his form will stay for more than a year or two. But Imran's did until he was 35, when he took Pakistan to the semi-final of the World Cup in 1987. He had announced he would retire after the World Cup, and kept his word. However, he was pulled out of retirement by Zia-ul Haq and Imran led the Pakistan team to the West Indies the next year, putting up again a great showing. Thereafter, it was more Imran the captain rather than Imran the performer, winning the Nehru Cup in India in 1989 and the World Cup in 1992. It was also somewhat late in his career that Imran achieved stature. He made his debut in 1971 in England. By 1974 he started playing for the national team regularly, though even till then he was promising but little more than that. He won recognition in 1976-1977, when Pakistan went Australia and Imran took 12 wickets in the Sydney Test to level the series. 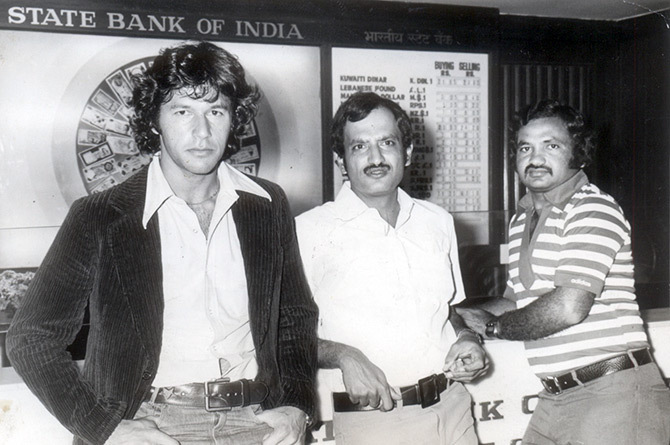 IMAGE: Imran Khan, left, with Ajit Wadekar, centre and Mushtaq Mohammad. Then Pakistan captain Mushtaq Mohammed's remark that Imran was 'as fast as Lillee' announced to the world that another great quick bowler was born. Until then Imran was playing second fiddle to Sarfraz Nawaz. Imran had the misfortune to be in an age when there was a surfeit of mighty all-rounders. He was never reckoned as good as Ian Botham of 1978-1983. Indians would not put him on a par with Kapil Dev or Vinoo Mankad, though Asif Iqbal thought he was better than both. Clive Rice, slightly senior to Imran, was the best of his age. And Sobers, the greatest of all time, viewed Hadlee as better than Botham. Except Pakistanis, no one thought much of Imran as an all-rounder. This was being unfair to him because he was no weakling as a batsman. IMAGE: Sunil Gavaskar and Imran Khan at the end of a game. Imran was known for being a straight talker. When the Movement for Restoration of Democracy was making a feeble start in Pakistan in the early 1980s, there was speculation Imran might join it. He didn't. Perhaps because he thought getting involved in politics might affect his cricketing fortunes. His plain-heartedness bordered on being outspoken when he doubted Zaheer Abbas's ability to play fast bowling comfortably. Zaheer retired from the game, saying Imran was 'jealous of him'. 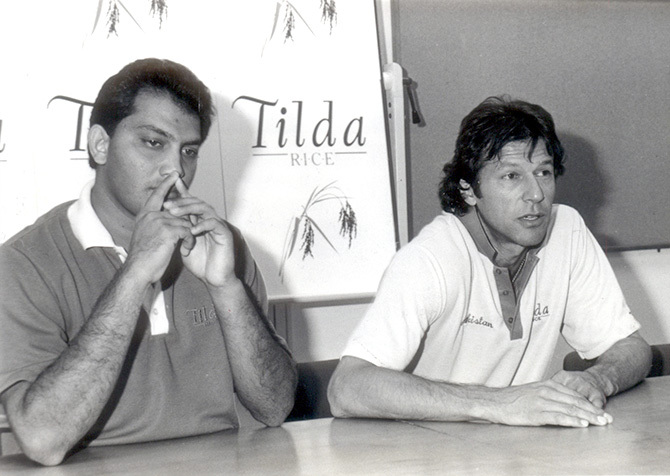 IMAGE: Imran Khan with Mohammad Azharuddin, right. Among all the prominent political personalities in the world today, India knows Imran longer than it does anyone else. This, however, holds out no assurance, not even of India-Pakistan cricket resuming. And the qualities other than cricket that Imran was admired for appear faded and time-worn now. In politics, his will be a washed-up job. Hence, the Imran story, if it is at all recounted, will start again in 1971 or 1976.